On Trial - "Parchment Farm" 7"
This 7" was recorded in 2002 and shows the totally psychedelic side of the Danish band On Trial. The A side is a great 3 minute version of the old Blue Cheer song, "Parchment Farm". The band has a fantastic 60's raw garage sound on this. A great rendition but shorter than the original. The B-side is a cover of "Interstellar Overdrive" by Pink Floyd. This is probably the most far out and psychedelic thing that the band has ever recorded. Incredible sound effects and a great version of this classic song, covered by a lot of bands. Limited to 500 copies only. For more information you can visit the On Trial web site at: http://www.ontrial.suite.dk. 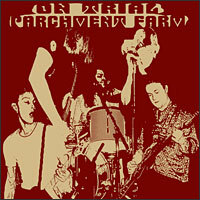 The Parchment Farm 7" is distributed by Freakphonic. You can visit their web site at: http://www.freakophonic.dk.